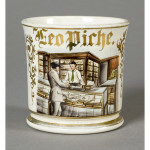 This category is focused on shaving mugs featuring images and occupations around tobacco: cigarettes, cigars, chewing tobacco, and tobacconist shops, etc. 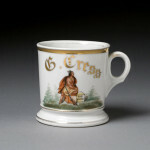 These mugs are very popular with collectors who focus not just on mugs, but also on more general country store genres that have a heavy focus on tobacco, which was a very popular habit among Americans at the time. 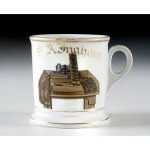 For more information about Tobacco themed shaving mugs please don’t hesitate to contact us on the contact page.